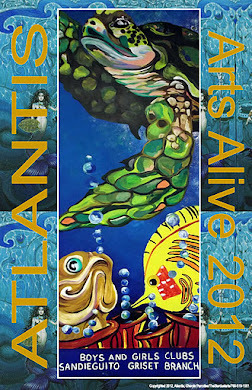 The Stardust Arts: An Undersea Adventure in a Lifetime of Discovery, Atlantis. An Undersea Adventure in a Lifetime of Discovery, Atlantis. Atlantis was a collaborative project by The Stardust Arts students, taught by artist Cheryl Ehlers, at the Boys and Girls Clubs of San Dieguito, Griset Branch, Encinitas, CA., by sttudents, Nikki Costido, Ruby Fenney, Heather Gibson, Isabelle Kenny, Sarah Gallardo and Sean. This was the first time the BGC has been invited by the 101 Artists Colony to participate in the 13th annual Arts Alive Banner Project; it took 9 hours of painting for these first time students who are presently participating in the “Angels” program sponsored in part by a grant from the City of Encinitas and the Mizel Family Foundation Community Program, 2011. Students were simply thrilled to see the finished project! Their video can be seen of its creation on YouTube, “thestardustarts1” channel. at http://youtu.be/eD_Yrd9us3I. The Stardust Arts, is recognized by the California State Assembly and the San Diego County Board of Supervisors, and is joint ventured with the non-profit organization, Dr. Wilderness Show out of Orange County who teaches “magic for the planet”. Look for us in the Carlsbad, Art in the Village in August 12, 2012 for a creative art activity center. The banner, Atlantis, #7 is for sale, and will hang on Hwy 101 until mid May. when an open auction, May 20, 2012 at the Cardiff Town Center will host the 101 banners. Proceeds will be donated to the Boys and Girls Clubs, courtesy of Cheryl Ehlers. Stardust would like to thank the host, Danny Salzhandler and the 101 Artists Colony for giving these children an opportunity to part of the art community. “ It was an experience they will never forget, and a lifetime memory,” stated artist, Cheryl Ehlers. For information on The Stardust Arts, visit www.thestardustarts.com or contact Cheryl Ehlers at 760-519-1551.